Grab a button and spread the word, won't you? Again this year, we will host special blog hops where you will have the opportunity to blog about your experiences with family and the proclamation. There will also be prizes. 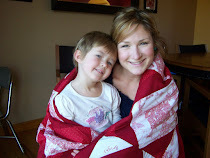 Comment on any of the guest posts that we publish daily to be entered to win. Sunday, September 23rd: Share your personal thoughts about family or experiences with the Proclamation. Wednesday, September 26th: Photo Essay. 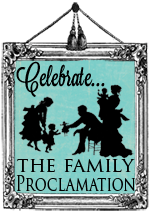 Please write a post sharing photos of your family or photos that help illustrate what The Family Proclamation means to you. John Barney of The Book of Mormon, It's the BOM! Serene Heiner of Serene is my Name, Not my Life! If you'd like to read posts from previous celebrations, click here. I also found Elder Ballard's talk from the most recent General Conference to be full of insights as to why we need to make family a priority in our lives. Give it a listen below, and have a great Sunday! As always, looking forward to it! It is one of my favorite times of the year! I haven't been able to post here for ages. So glad whatever was wrong is fixed now! I'm finally recognized by blogger-hurrah! been reading but no commenting allowed...lol!